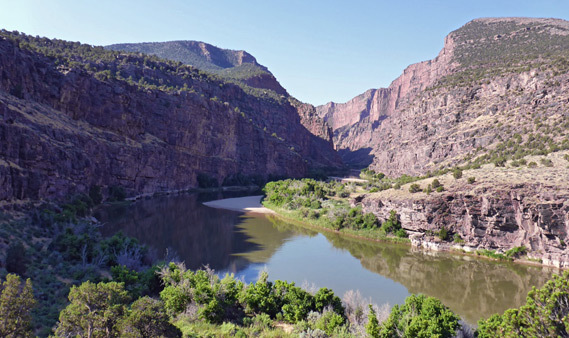 The northernmost section of Dinosaur National Monument contains the Canyon of Lodore, a deep, cliff-bound, rapid-filled stretch of the Green River that is generally inaccessible overland, and instead can only be viewed at water level, by boating or rafting. 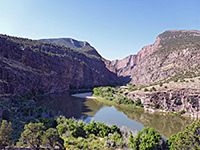 The river is enclosed by layered, reddish cliffs of sandstone and quartzite, close to the north edge of the Colorado Plateau and the east edge of the Uinta Mountains, and the upstream end of the canyon, where cliffs rise up abruptly from the flat lowlands of Browns Park, is the evocatively-titled Gates of Lodore. This location was named by explorer John Wesley Powell who was inspired by a gorge described in the poem 'Cataract of Lodore' by Robert Southey, which was itself a homage to Lodore Falls in the English Lake District. 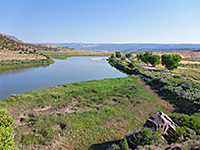 Further north, the Green River flows across more gentle terrain, of grassy plains and low hills, through a remote and very little inhabited section of far northwest Colorado, many miles from any town of significance. 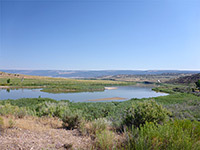 The remoteness is due in part to the barriers created by the Green River, and the Yampa River to the south; the former is bridged only once (at Flaming Gorge Dam) in the 150 miles between Jensen, UT and Green River, WY, while the Yampa River, south of the Lodore area, is also cliff-bound and un-crossable. As a consequence, this part of the national monument sees very few visitors. 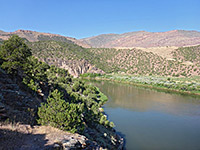 Most people here are boaters, embarking on trips down the Green, though others come to relax in or by the river, to walk the short trail to a viewpoint of the start of the narrows, or to stay at the pleasant, 17-site campground, right beside the water's edge. 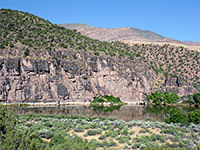 The Gates of Lodore region is just 27 miles distant from the national monument headquarters near the dinosaur quarry, but much further by road; 117 miles via US 191 and Flaming Gorge Dam in the west, or 134 miles via US 40 in the east, a route which although longer is usually somewhat quicker to drive. The approach is along the only major road in this part of northwest Colorado, Hwy 318, which connects US 191 with US 40; the road runs close to the Green River for a while, either side of the Utah-Colorado stateline, but moves away to the east; as it leaves the river, an unpaved side road forks south, crossing a tributary (Vermillion Creek) then joining another good quality gravel track, County Road 34, which continues along a high grassy ridge, then descends to the river, passing a ranger station, boat launch area and campground before ending at the parking area for the half mile Gates of Lodore Trail. The red cliffs enclosing the canyon are visible for several miles away across the plains, and make a great contrast with the green, grassy landscape to the north. Campground fees are good value at $8 between May and September, when drinking water is provided; there is no charge at other times. 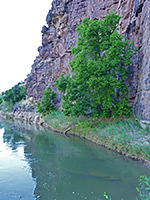 The path at the end of the road starts with a few switchbacks as it climbs 100 feet up reddish slopes and ledges, then becomes level, heading due south over a bench overlooking the river, sparsely covered with bushes and cacti, and ending after half a mile at a south-facing viewpoint at the rim of a little cliff. The canyon begins directly ahead, confined by sheer red walls that quickly rise to 400 feet, with steep slopes another 1000 feet or more above. 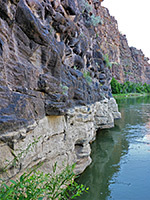 The cliffs prevent any trail into the canyon, though another quarter of a mile of the east bank is accessible, by walking down ledges below the viewpoint, across a grassy basin with a few trees, home to many biting insects in spring and summer, then along rocky ledges and narrow banks, to the start of the first sheer cliff section. Wildflowers along the trail are limited, due to the arid, exposed position; the shady riverbanks have rather more species.